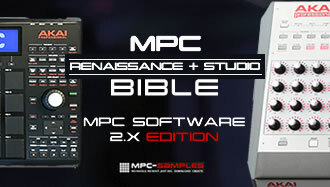 My ‘MPC: Sampling Laid Bare’ tutorial book has been updated for MPC Software 1.8.2, with over 70 extra pages of content as well as hundreds of updates to the existing tutorials to ensure they are fully compatible with all the new 1.8, 1.8.1 and 1.8.2 features and GUI changes. EDIT: Now fully updated for 1.9! New content includes full coverage of non-destructive chopping techniques, the many improvements to SAMPLE EDIT including the new PROGRAM view and improved editing workflow features, pad start/end/offset parameters, the new pad perform mode, Alternating Loops, all relevant software and LCD GUI changes, plus countless smaller tweaks and improvements throughout the book! Digital eBook Bundle Now Included! As well as all the improvements to the book content, ‘MPC Sampling: Laid Bare‘ now includes EPUB and MOBI versions of the book, fully optimised for reading in iOS (iPad & iPhone), all tablets (Android, Windows etc), smartphones and dedicated ebook readers such as Kindle, Kobo & Nook – these versions are in addition to the 352 page PDF book (which is optimised for computer and laptop reading). Existing owners of the book can upgrade to this 6th Edition for a small upgrade fee – if you are an active subscriber to the MPC-Samples newsletter you will have received your upgrade link via email; if you have not received an email, contact me with your original order number or original order email address and I’ll send you your upgrade link asap. No sorry, I’ve only got English tutorials. I’m going to buy an MPC ren , my MPC 1000 died after 12 years is the ren dope?